The younger sister of Nadia Boulanger, a famous music teacher, Lili Boulanger died of Crohn’s disease aged just 24 in 1918. But before she died, and despite having weak health from infancy, she became the first female winner of the Prix de Rome composition prize, previously won by the likes of Berlioz, Debussy and Boulanger’s father, Ernest, who died when she was six. Ernest and his own father, Frédéric, both taught at the Paris Conservatory, and young Lili was herself tutored by family friends Maurice Ravel and Gabriel Faure. As the Quietus reported, her work – big, bold, shadowed by war and death – wasn’t recorded until 1960, in an album overseen by Nadia Boulanger. Les sirènes (1911) is written for solo soprano and three part choir. The topic, mermaids, uses a text by Charles Grandmougin. This work was first premiered at one of her mother’s exclusive musical gatherings. Auguste Mangeot a critic from the Paris music journal Le Monde Musicale, reported that everyone liked the piece so well it had to be repeated. Boulanger used this piece as a preparation for the Prix de Rome competition, and from it one can see her firm grounding in the classical technique taught at the Conservatoire. She uses this technique as a starting point and employs many devices popular at that time to create a personal and clear statement. The poetry of this selection deals with the mythological siren, a creature that sings to seduce sailors to steer closer; when they do, the sirens devour the men. Boulanger depicts this scene as vividly as she possibly can. She uses a pedal tone on F♯ combined with ascending C♯ octaves at the beginning to portray the mesmerizing effect of the sirens. She uses this effect for twenty-eight measures, in effect, lulling listeners into a trance-like sleep. The work is dedicated to Madame Jane Engel Bathori.Bathori, a soprano, was known for her concert organisation, and supported many new artists and composers. Boulanger composed three psalm settings: Psalms 24, 129 and 130. She composed Psalm 24, entitled La terre appartient à l’Eternel (“The earth is the Lord’s”), in 1916 while she was resident in Rome. The work is dedicated to Monsieur Jules Griset, who was the director of Choral Guillot de Saint-Brice. Durand published the work in 1924. The work is scored for choir (consisting of soprano, alto, tenor and bass), accompanied by organ and brass ensemble (consisting of 4 horns, 3 trumpets, 4 trombones, 1 tuba), timpani and 2 harps. Boulanger’s score uses brass fanfares and homophonic choral passages: the contrast of sections contrast to the style of her 1912 Prix de Rome winning cantata, Faust et Hélène, as heard in Yan Pascal Tortelier’s recording. Psalm 129 was also composed in 1916 in Rome. This psalm is much longer than Psalm 24 and is composed for full orchestra.The premiere performance was held at the Salle Pleyel in 1921, conducted by Henri Busser. Du fond de l’abîme (Psalm 130: De Profundis/”Out of the depths”), is composed for voice and orchestra, and dedicated to the memory of her father, as noted at the top of the score. Boulanger’s psalms convey her Catholic faith. She completed this work when she was only twenty-two, yet it sounds mature and conveys her developed compositional style. Ristow writes that Boulanger composed Du fond de l’abîme in reaction to World War I.
Lili Boulanger finished this Pie Jesu (1918) towards the end of her life, but “the first of Lili Boulanger’s sketches for the Pie Jesu are to be found in a composition book she used between 1909 and 1913.” As noted by her sister, Nadia, she dictated the work to her.Scholars such as biographer Léonie Rosenstiel and Olivia Mattis speculate that Boulanger intended to write a complete Requiem Mass but did not live to complete it. Scored for high voice, string quartet, harp and organ, Boulanger’s setting is sparse. Pie Jesu is the only surviving Boulanger text setting that uses an explicitly Christian text. This work, “Old Buddhist Prayer”, is written for tenor and chorus (soprano, alto, tenor and bass), accompanied by a large orchestra consisting of: 2 flutes, 2 oboes, English horn, 2 clarinets (B♭), bass clarinet (B♭), 2 bassoons, sarrusophone + 4 horns (F), 3 trumpets, 4 trombones, tuba + tympani, cymbals, bass drum + celesta + 2 harps, strings. Composed during 1914–1917, as many of her works, it was not performed until after World War I, in 1921. This work is not based within Catholicism, as her psalms were. Rather, it sets a Buddhist daily prayer. James Briscoe notes that this work shows similarities to Stravinsky but also to the next generation. This instrumental work was the last Boulanger was able to compose by her own hand, without help in writing. This symphonic poem is one of the last pieces Lili Boulanger completed. Different arrangements were produced including a version for violin, for flute, and for piano, another for piano trio, and another for orchestra. Although she finished both these instrumental works, her sister Nadia reportedly edited the works to add dynamics and performance directions. In March 1939, Nadia Boulanger with the help of American friends created the Lili Boulanger Memorial Fund. It has two objectives: to perpetuate Lili Boulanger’s music and memory and financially support talented musicians. The Lili Boulanger Memorial Fund does not accept applications for its annual competition but a list of candidates is produced by a group of nominators selected each year by the Board of Trustees. Each nominator can then propose a candidate for the prize. The Fund then awards the Prix Lili Boulanger to one of these candidates. The University of Massachusetts Boston curates the fund.Previous winners have included Alexei Haieff (1942), Noël Lee (1953), Wojciech Kilar (1960), Robert D. Levin (1966, 1971) and Andy Akiho (2015). 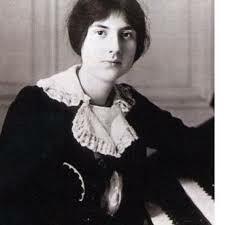 In April 1965, the Friends of Lili Boulanger Association was created in Paris. This organization became the Nadia and Lili Boulanger International Centre (CNLB) in 2009. The asteroid 1181 Lilith was named in her honor. The two definitive biographies are The Life and Works of Lili Boulanger (ISBN 0-8386-1796-4) by the American musicologist Léonie Rosenstiel and À la recherche de Lili Boulanger by French musicologist and tenor Jérôme Spycket.